Canberra, Australia – March 3, 2019: Anne Van Dam from The Netherlands has surged home on the final nine to win the Canberra Women’s Classic at Royal Canberra Golf Club by three strokes: her third Ladies European Tour title inside six months and her fourth overall. Van Dam began the day as joint leader on 11 under and duelled with defending champion Jiyai Shin (Korea Republic) through the back nine before picking up four shots in the final four holes with a final round of six under 65. Katja Pogacar (Slovenia) – the other overnight leader – also came home strongly with two birdies in the final four holes to finish 14-under par, one ahead of Shin. Van Dam said after shooting eight under in the second round to put her in contention, she knew she had to go to another level to win the championship. The day began with a group of five players separated by just two shots at the top of the leaderboard and while Van Dam led at the halfway mark by one shot, Shin and Carly Booth (Scotland) and Madelene Sagstrom (Sweden) were all within striking distance. Shin looked the most threatening having moved to 12 under and she then drew level with Van Dam at the 12th, only to lose the lead the next hole with a bogey five. But the defending champion refused to surrender her title and again drew level with a birdie on 15. Just when it looked like the championship was shifting, the long-hitting Van Dam reached the 15th in two and then holed the eagle putt to move to 15 under. Shin continued to stake a claim for the title when she birdied 16 to be one shot behind Van Dam. The South Korean bogeyed 17 and Van Dam seized the advantage with birdie on the 16th and then crowned her victory with another birdie on 18 to finish on 17 under (196). 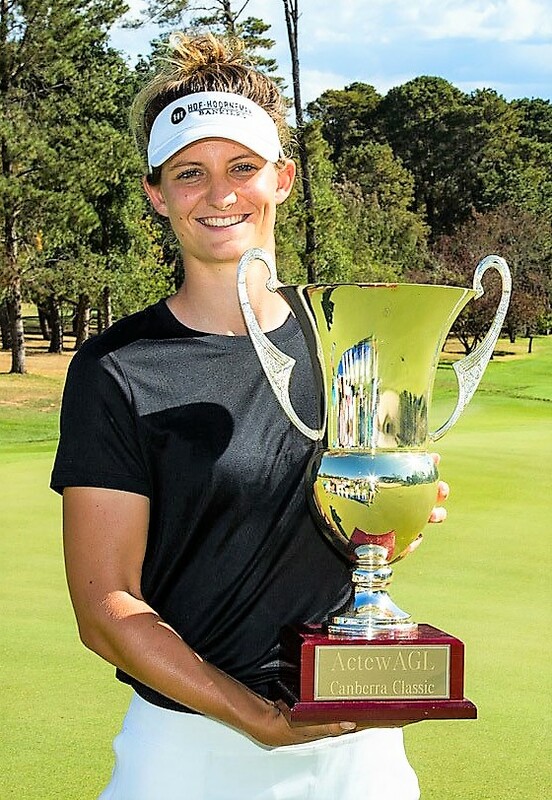 The ActewAGL Canberra Classic is Van Dam’s fourth title on the European Tour. Katja Pogacar surged home with a final round of 68 to claim second place, her best finish on the Ladies European Tour. “It was my first time playing in the last group in front of a large gallery, which was different and a great experience…and I loved it. Anne Van Dam won with a 17 under par, 54-hole total of 196. Her cash prize was 14,080 euros. Carly Booth from Comrie finished fourth at 11 under par 202 (67-65-70) and pocketed 4,224 euros. Fellow Scot Gemma Dryburh finishede T24 on two-under 211 (72-69-70) and earned 1,147 euros. A third Scot, Kyle Henry, finished T38 on 214 (69-72-73) and earned 661 euros. The next event on the Ladies European Tour is the Women’s New South Wales Open at Queanbeyan, which is just 20 minutes from the venue of this week’s tournament at Royal Canberra Golf Club.